The Steel String Clean Drive faithfully recreates the tonality and feel of the iconic Dumble Steel String Singer amplifier in a stompbox format. 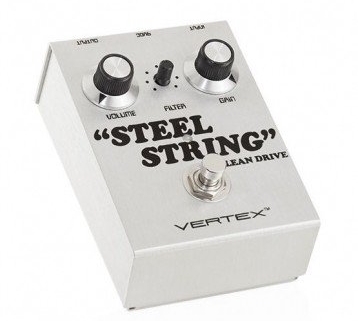 Designed alongside a real Steel String Singer (#001), this 100% analog tone tool will do it all from Overdrive, to Fat Boost, to Compression, to EQ shaping and more. Get the unmistakable Crystal-Clear Overdrive and Fat Clean Tones from albums like "Texas Flood", "Venus Isle", and "Continuum" through any clean amp platform. 9-18VDC center-negative power operation (adapter not included).